Pretend you are Bono? Not a great idea for suits. Bank of America and MBNA merged. Two corporate guys decided that they should write and perform a take off of U2′s ‘One’ to celebrate. I love that someone leaked it so all of us could enjoy!! ‘The Hype Machine’ – Deserves more hype! Another sub-20 year old has turned the music industry on its head, but not many people know it yet. Anthony Volodin, a 20 year old student, has created The Hype Machine. The Hype Machine scans MP3 blogs for people posting messages about bands and songs. It aggregates all the “hype” and then posts them all to pages on The Hype Machine. The site features a media player, playing what is being “hyped.” With the click of a mouse you can buy what you like from Amazon and iTunes. All MP3′s is finds are cached on its servers. Try searching for something. You most likley find it. Anthony’s concept is so simple. The really good ones are! “Hypnotic, Hypnotic, Hyp, Hyp, Hypnotic” still rings in my ears from a party they played about a year ago. It was 2:30 AM and people were going crazy for them. 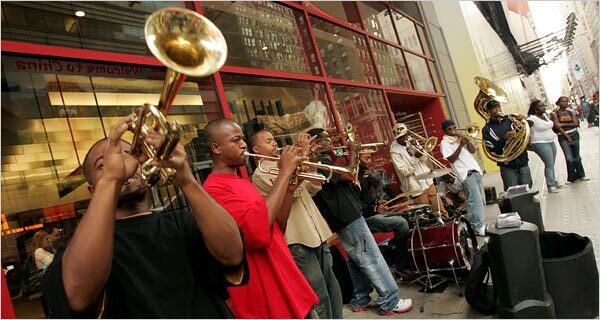 The Chicago brass band has headed to live in Queens. These guys are great! One of the best brass bands I’ve seen. Hypnotic has played a couple parties I’ve had. Both of them late-late night, starting after midnight and playing until the wee-hours. They have such energy that it is hard for anyone turn away. The New York Times has written an article yesterday and has a video with interviews and music. It did not take these guys long to make waves in the big apple. I could not be happier for them!! Hope to see them in Chicago again someday.